BUTCHER THE SHRIKE was not the only newcomer in the Old Orchard. There was another stranger who, Peter Rabbit soon discovered, was looked on with some suspicion by all the other birds of the Old Orchard. The first time Peter saw him, he was walking about on the ground some distance off. He didn't hop but walked, and at that distance he looked all black. The way he carried himself and his movements as he walked made Peter think of Creaker the Grackle. In fact, Peter mistook him for Creaker. That was because he didn't really look at him. If he had he would have seen at once that the stranger was smaller than Creaker. Presently the stranger flew up in a tree and Peter saw that his tail was little more than half as long as that of Creaker. At once it came over Peter that this was a stranger to him, and of course his curiosity was aroused. He didn't have any doubt whatever that this was a member of the Blackbird family, but which one it could be he hadn't the least idea. "Jenny Wren will know," thought Peter and scampered off to hunt her up. "Who is that new member of the Blackbird family who has come to live in the Old Orchard?" Peter asked as soon as he found Jenny Wren. "There isn't any new member of the Blackbird family living in the Old Orchard," retorted Jenny Wren tartly. "There is too," contradicted Peter. "I saw him with my own eyes. I can see him now. He's sitting in that tree over yonder this very minute. He's all black, so of course he must be a member of the Blackbird family." "Tut, tut, tut, tut, tut!" scolded Jenny Wren. "Tut, tut, tut, tut, tut! That fellow isn't a member of the Blackbird family at all, and what's more, he isn't black. Go over there and take a good look at him; then come back and tell me if you still think he is black." Jenny turned her back on Peter and went to hunting worms. There being nothing else to do, Peter hopped over where he could get a good look at the stranger. The sun was shining full on him, and he wasn't black at all. Jenny Wren was right. For the most part he was very dark green. At least, that is what Peter thought at first glance. Then, as the stranger moved, he seemed to be a rich purple in places. In short he changed color as he turned. His feathers were like those of Creaker the Grackle—iridescent. All over he was speckled with tiny light spots. Underneath he was dark brownish-gray. His wings and tail were of the same color, with little touches of buff. His rather large bill was yellow. Peter hurried back to Jenny Wren and it must be confessed he looked sheepish. "You were right, Jenny Wren; he isn't black at all," confessed Peter. "Of course I was right. I usually am," retorted Jenny. "He isn't black, he isn't even related to the Blackbird family, and he hasn't any business in the Old Orchard. In fact, if you ask me, he hasn't any business in this country anyway. He's a foreigner. That's what he is—a foreigner." "But you haven't told me who he is," protested Peter. "He is Speckles the Starling, and he isn't really an American at all," replied Jenny. "He comes from across the ocean the same as Bully the English Sparrow. Thank goodness he hasn't such a quarrelsome disposition as Bully. Just the same, the rest of us would be better satisfied if he were not here. He has taken possession of one of the old homes of Yellow Wing the Flicker, and that means one less house for birds who really belong here. If his family increases at the rate Bully's family does, I'm afraid some of us will soon be crowded out of the Old Orchard. Did you notice that yellow bill of his?" Peter nodded. "I certainly did," said he. "I couldn't very well help noticing it." "Well, there's a funny thing about that bill," replied Jenny. "In winter it turns almost black. Most of us wear a different colored suit in winter, but our bills remain the same." "Well, he seems to be pretty well fixed here, and I don't see but what the thing for the rest of you birds to do is to make the best of the matter," said Peter. "What I want to know is whether or not he is of any use." "I guess he must do some good," admitted Jenny Wren rather grudgingly. "I've seen him picking up worms and grubs, but he likes grain, and I have a suspicion that if his family becomes very numerous, and I suspect it will, they will eat more of Farmer Brown's grain than they will pay for by the worms and bugs they destroy. Hello! There's Dandy the Waxwing and his friends." A flock of modestly dressed yet rather distinguished looking feathered folks had alighted in a cherry-tree and promptly began to help themselves to Farmer Brown's cherries. They were about the size of Winsome Bluebird, but did not look in the least like him, for they were dressed almost wholly in beautiful, rich, soft grayish-brown. Across the end of each tail was a yellow band. On each, the forehead, chin and a line through each eye was velvety-black. Each wore a very stylish pointed cap, and on the wings of most of them were little spots of red which looked like sealing-wax, and from which they get the name of Waxwings. They were slim and trim and quite dandified, and in a quiet way were really beautiful. You can tell him from his cousin the Bohemian Waxwing by his smaller size. As Peter watched them he began to wonder if Farmer Brown would have any cherries left. Peter himself can do pretty well in the matter of stuffing his stomach, but even he marvelled at the way those birds put the cherries out of sight. It was quite clear to him why they are often called Cherrybirds. "If they stay long, Farmer Brown won't have any cherries left," remarked Peter. "Don't worry," replied Jenny Wren. "They won't stay long. I don't know anybody equal to them for roaming about. Here are most of us with families on our hands and Mr. and Mrs. Bluebird with a second family and Mr. and Mrs. Robin with a second set of eggs, while those gadabouts up there haven't even begun to think about housekeeping yet. They certainly do like those cherries, but I guess Farmer Brown can stand the loss of what they eat. He may have fewer cherries, but he'll have more apples because of them." "Oh," replied Jenny Wren, "they were over here a while ago when those little green cankerworms threatened to eat up the whole orchard, and they stuffed themselves on those worms just the same as they are stuffing themselves on cherries now. They are very fond of small fruits but most of those they eat are the wild kind which are of no use at all to Farmer Brown or anybody else. Now just look at that performance, will you?" There were five of the Waxwings and they were now seated side by side on a branch of the cherry tree. One of them had a plump cherry which he passed to the next one. This one passed it on to the next, and so it went to the end of the row and halfway back before it was finally eaten. Peter laughed right out. "Never in my life have I seen such politeness," said he. "Huh!" exclaimed Jenny Wren. "I don't believe it was politeness at all. I guess if you got at the truth of the matter you would find that each one was stuffed so full that he thought he didn't have room for that cherry and so passed it along." "Well, I think that was politeness just the same," retorted Peter. "The first one might have dropped the cherry if he couldn't eat it instead of passing it along." Just then the Waxwings flew away. It was the very middle of the summer before Peter Rabbit again saw Dandy the Waxwing. Quite by chance he discovered Dandy sitting on the tiptop of an evergreen tree, as if on guard. He was on guard, for in that tree was his nest, though Peter didn't know it at the time. In fact, it was so late in the summer that most of Peter's friends were through nesting and he had quite lost interest in nests. Presently Dandy flew down to a lower branch and there he was joined by Mrs. Waxwing. Then Peter was treated to one of the prettiest sights he ever had seen. They rubbed their bills together as if kissing. They smoothed each other's feathers and altogether were a perfect picture of two little lovebirds. Peter couldn't think of another couple who appeared quite so gentle and loving. Late in the fall Peter saw Mr. and Mrs. Waxwing and their family together. They were in a cedar tree and were picking off and eating the cedar berries as busily as the five Waxwings had picked Farmer Brown's cherries in the early summer. 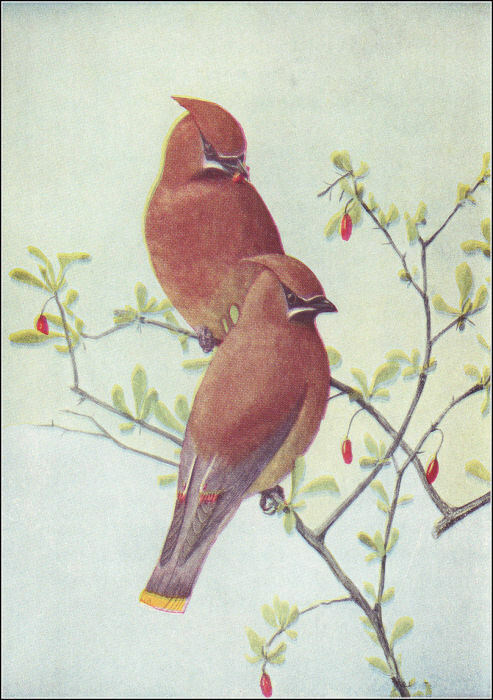 Peter didn't know it but because of their fondness for cedar berries the Waxwings were often called Cedarbirds or Cedar Waxwings.